It was a fascinating session, but don’t worry if you missed it because we took notes for you. You can watch the full talk recording here, or you can continue reading to find out the key insights that were shared by Martin and Tom. 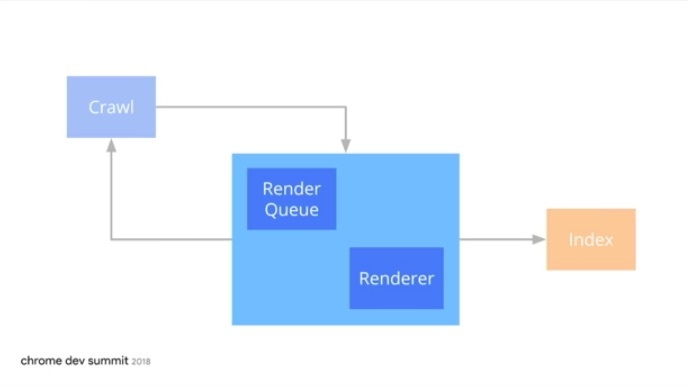 Skip Google’s rendering queue by using dynamic rendering. 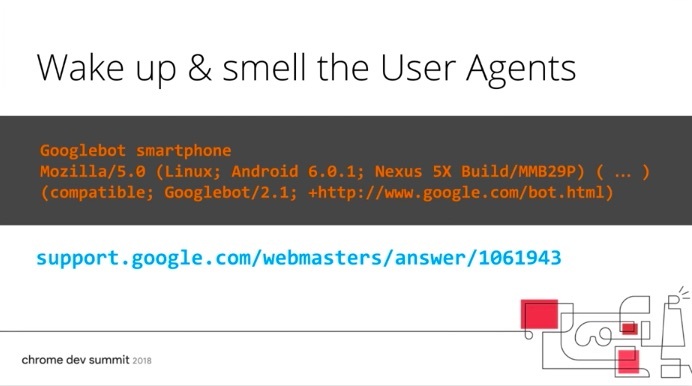 Detect user agents for social media crawlers and dynamically render content for them. Google is working on having its rendering service run alongside Chrome’s release schedule, so the renderer will always use the most up-to-date version of Chrome. The Rich Results Test is launching a live code-editing feature for testing changes in the browser. Google Search Console has launched share link functionality for issue reports. Use Babel and Pollyfill.io as workarounds for the limitations of the current Chrome 41 renderer. How long will pages stay in the render queue? The time from when a page is added to Google’s render queue until the rendered page is indexed can vary. Martin and Tom explained that it could be minutes, an hour, a day or up to a week before the render is completed and the page is indexed. They didn’t say weeks (plural) though, so it seems that the delay won’t be as long as SEOs may have initially feared! How can we help Google render content faster? Essentially, this method of rendering allows websites to skip the rendering pipeline, in that a server-side rendered version of your usually client-side rendered website will be shown to Googlebot. 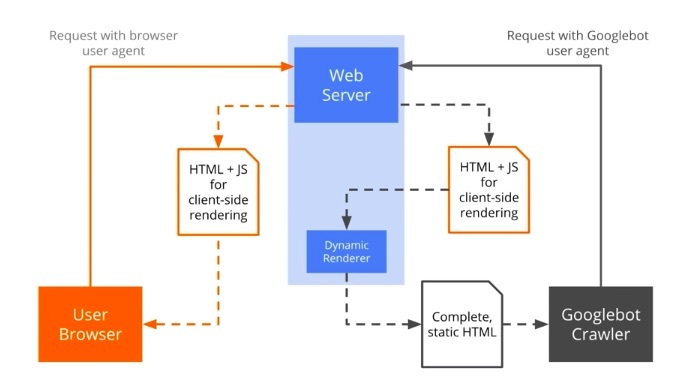 The dynamic renderer could either be an external service or could be running on the same web server. 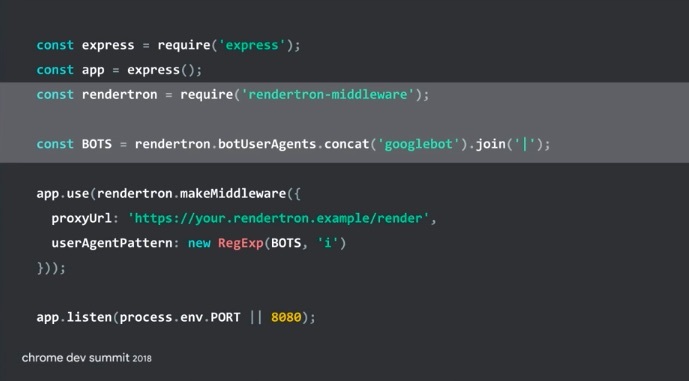 Here you can see that Rendertron works by using the command to pre-render content when the ‘googlebot’ user agent is detected. Another way to check which search engines and social media crawlers are accessing your content is to do a reverse DNS lookup to check which server the request is coming, whether it’s Google’s server, Twitter’s server etc. 2. 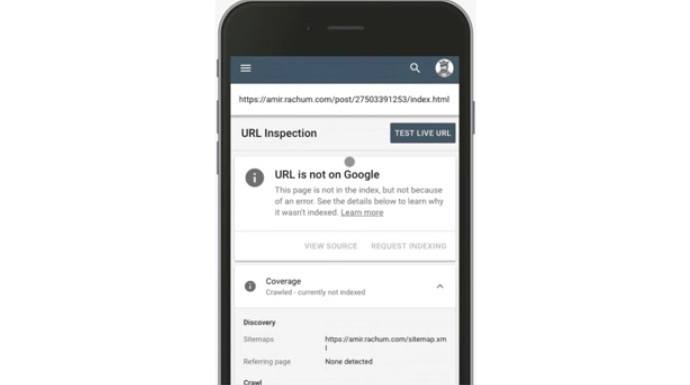 The URL Inspection Tool: Found in Google Search Console, you can use this tool to see what is blocking Googlebot from indexing a particular page and the reasons behind that. 3. 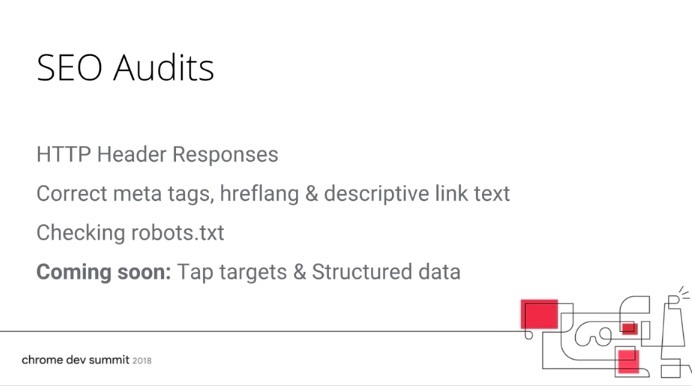 Lighthouse: There are existing SEO reports within Lighthouse which show whether or not elements like meta tags and hreflang were able to be found on a page, and there are more reports coming. When you see warning light emojis, you know something important is about to be shared. 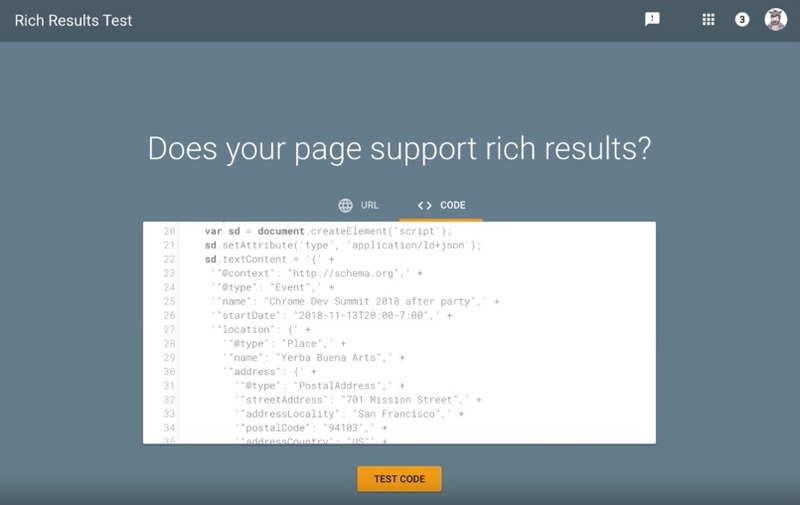 Martin announced that Google Search Console’s Rich Results Test will now support live code-editing. This means you’ll be able to write and test code live in the browser. Another new Google Search Console feature that was announced is the use of share links. 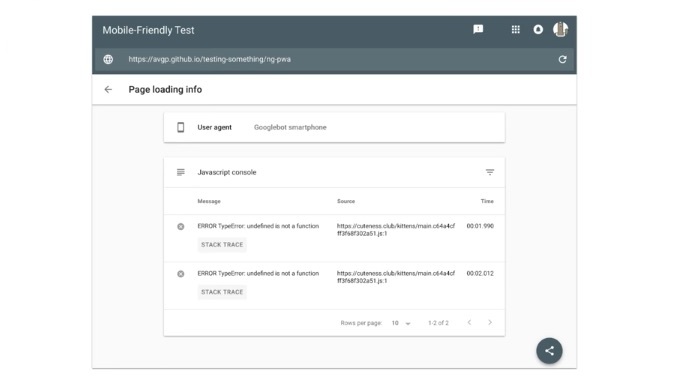 You’ll now be able to share issue reports directly with developers, so they can see exactly what the problem is and fix it without needing access to the company’s Google Search Console account. After the developer has fixed the issue in question, you’ll now be able to press a new ‘Validate Fix’ button to make sure the developer’s changes have worked correctly. Google hopes that this update will help streamline and speed up workflows across departments, especially between SEOs and developers. Use Babel to transpile ES6 code down to ES5 so Googlebot can render it. Google uses Chrome 41 for rendering which was released in 2015, so it doesn’t support some of the features of modern browsers released since then. It only supports ECMAScript 5 and doesn’t support ES6. Martin and Tom explained that dynamic rendering is a solution that works in the meantime, but shouldn’t have to be a long-term solution for website owners. This is why the team at Google are currently working on improving their rendering service. They don’t want Googlebot to simply catch up with the current version of Chrome, because we’ll keep having the same issue of the renderer being out of date each time a new version of Chrome is launched. Therefore, starting soon, Google will be working on a process where the rendering service will stay up to date with Chrome. This will work by having Googlebot run alongside the Chrome release schedule so the renderer will always be up-to-date with the most recent version of Chrome. 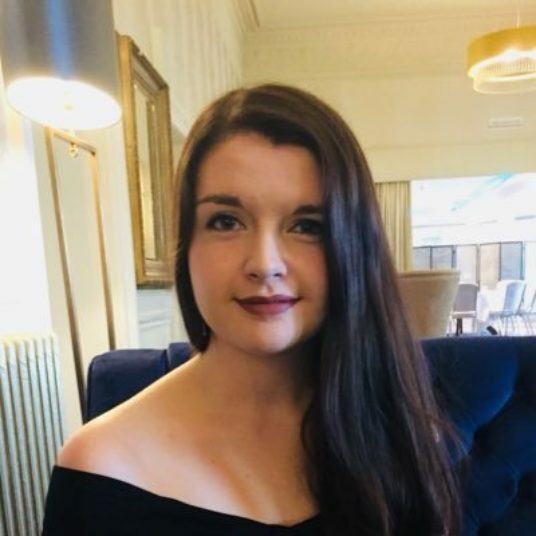 This is exciting news and I’m sure the SEO community will all be eagerly watching and waiting for any updates on this. If you enjoyed this post and want to read more of the latest news from Google, make sure you read our regular recaps of the Google Webmaster Hangouts on our blog, or subscribe to our newsletter where we’ll send announcements and tips from Google straight to your inbox.